1- 24 Pockets - Save Floor Space! These Wall Mounted Wood Literature Displays Will Display Your Literature Professionally! Hanging magazine holders that are mounted to walls are perfect for businesses that need to project a professional appearance. Our wall literature racks are primarily produced from solid oak wood and are available in a variety of styles and configurations. 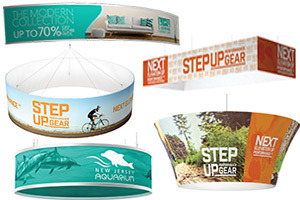 Wall mounts include styles that have single brochure pockets as well as multi-pocket, tiered or stepped. These wall mounted oak wooden display racks, also called wooden brochure racks and wood brochure stands, will add warmth to any lobby or waiting room while displaying and organizing magazines, digests and literature. Wall styles include. Overlapping Acrylic Literature Pockets. These hanging racks were specifically designed to hold your literature up straight without having the corners of your literature curl over. 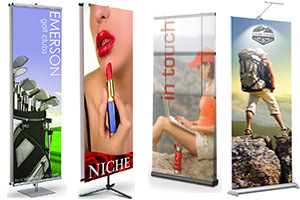 The combination of clear corner supports and curved tilted faces keep even single flyers and literature sheets standing straight up. The overlapping design allows for more pockets in smaller spaces. These displays are constructed with solid oak sides with clear acrylic shelves. Optional removable brochure dividers are available. Clear Acrylic Front Panels. These wall racks are constructed with solid oak sides and dividers. Clear acrylic front panels hold literature neatly in place. 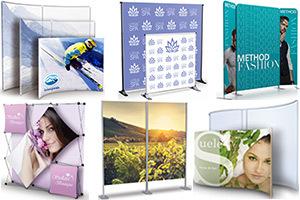 Removable plastic dividers, which are used when displaying 4" brochures are included. Overlapping Wood Pockets. This wooden display features unique overlapping wooden pockets that displays and organizes magazines and literature by keeping them tidy and visible. Literature Display With Open Shelves. Our wall literature displays feature slanted back shelves to enable a full view of literature while keeping it standing upright. Showcase brochures, magazines, periodicals, publications, catalogs, digests, books, flyers and more. 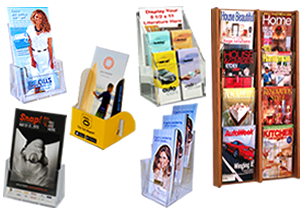 Wall mounted magazine racks that hold brochures, periodicals, publications, magazines and flyers will keep your waiting room organized and professional while saving space. All racks are pre-drilled with hardware included for simple wall mounting.